I am a single mom and have a 12 year old son. 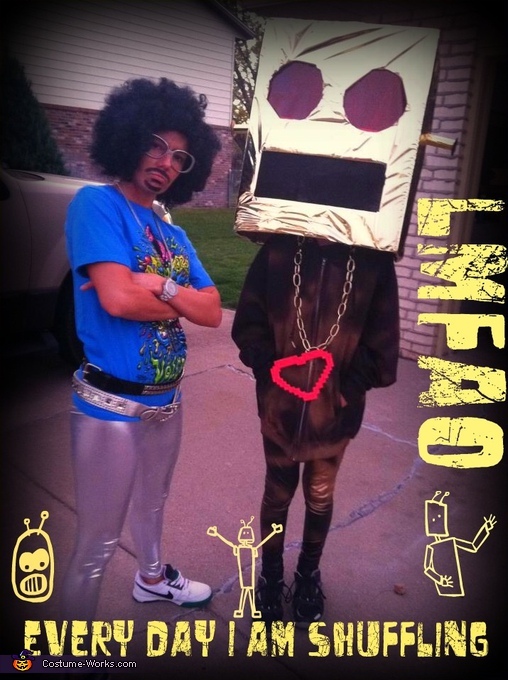 He decided last minute on Halloween to be the shuffle bot off of LMFAO. Put together costumes for him and I to go out trick or treating. We shuffled down the neighborhoods and we were a hit in town! Robot head is made out of a cardboard box eyes even lit up. He had a blast more memories for the future. I think that costume was for real stupid butts!!!!!!! !At least have a little bit of sparkles in it to make a beautiful lmfao costume!!!!!!!!! Sorry I said that,I just thought it needed a little bit of dazzle in it!!!!! !Oh and by the way that box looked kinda' similar to the real box!!! !